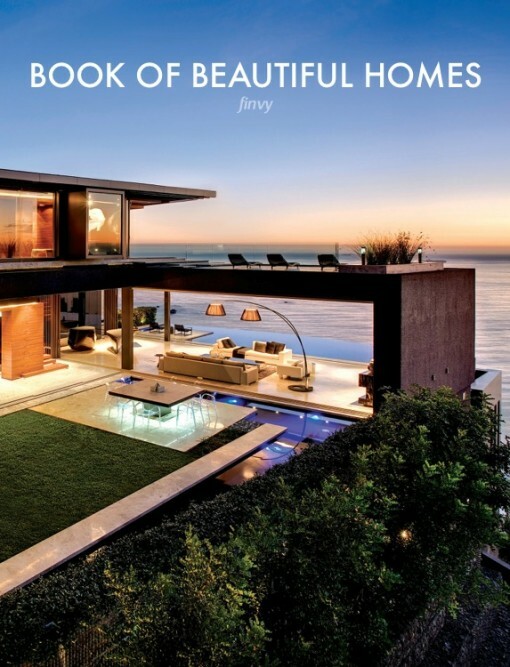 Concrete has long acted as a foundation for many homes. 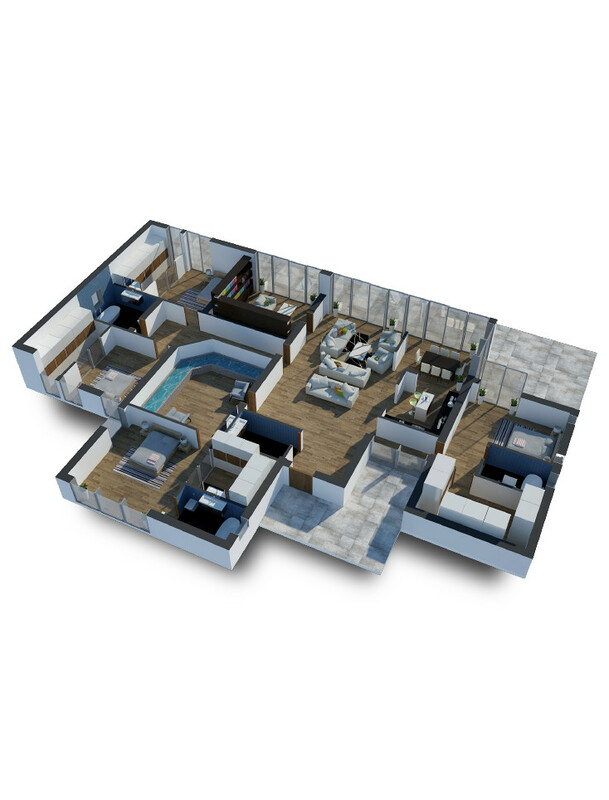 Its practical applications are certainly common knowledge as an affordable and durable basis for buildings of all types. 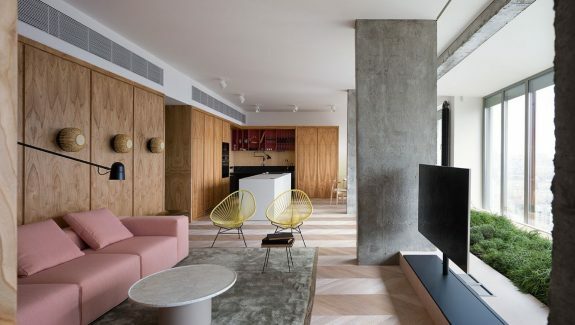 However, it was not until fairly recently that concrete became more of a focal point -- and interior design element that went beyond practical into an aesthetic choice. 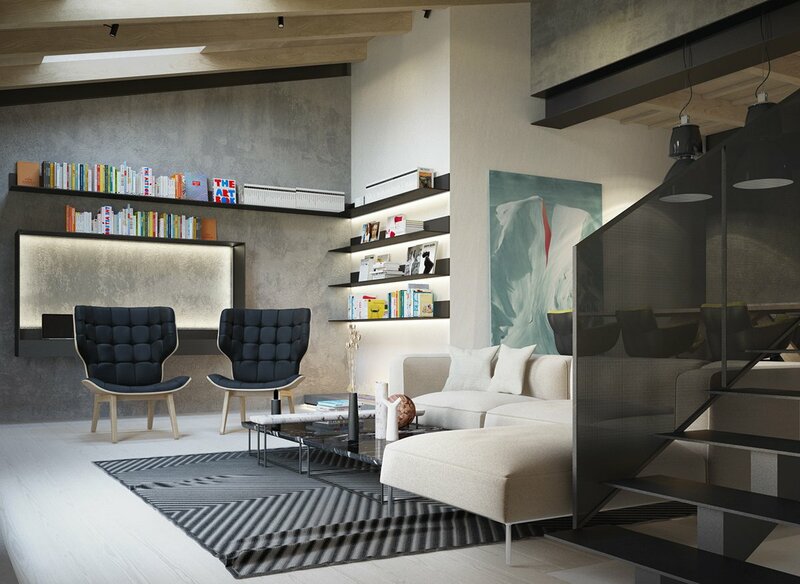 In this round up, you will see not only the more expected industial-style living rooms that use exposed brick and concrete for an unfinished look, but also sleek, modern, minimalist, and even somewhat rustic designs that allow the concrete effect to shine, either as a focal point or an accent. 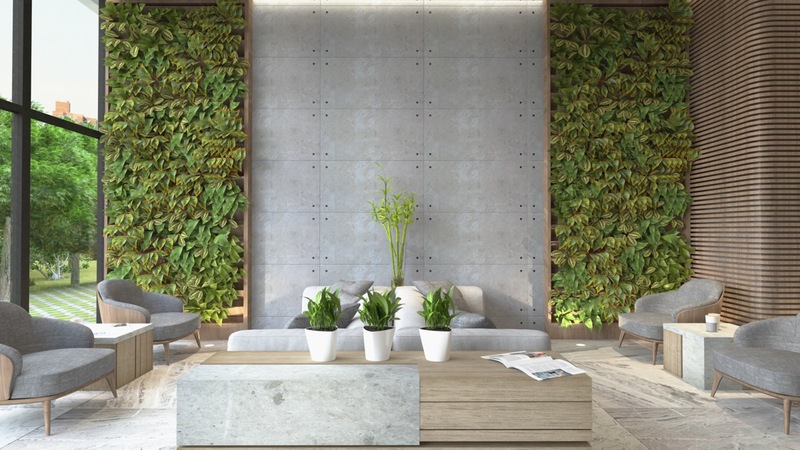 In this bright living room, indoor house plants stand in stark contrast to the concrete accent wall for a beautiful marriage of the natural and manmade. 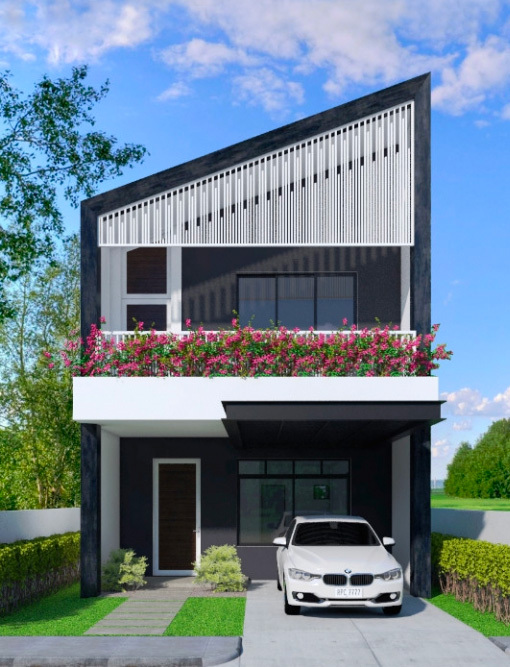 Of course, keeping the greenery outside and embracing the many shades of gray is also a valid choice. 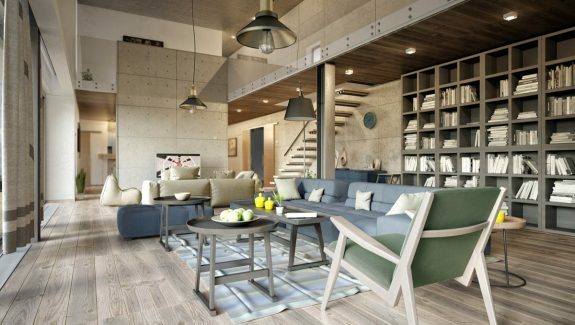 You will see in many of these living rooms that wood and concrete work well together, here as a frame for a simple, modern sofa. 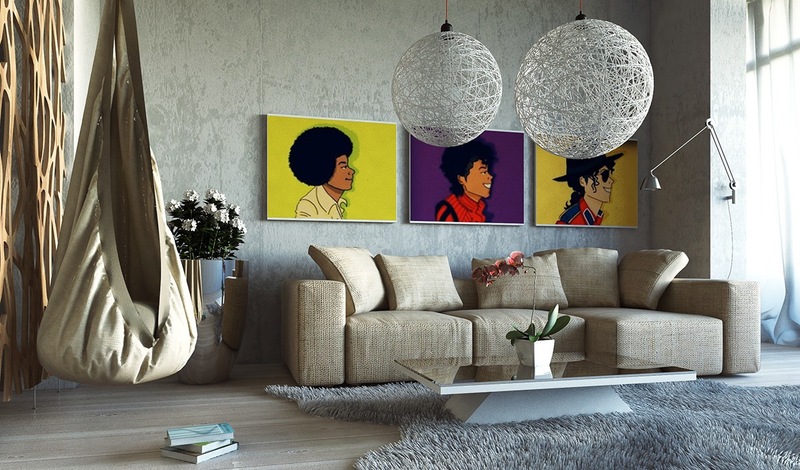 The use of concrete certainly does not have to preclude art, color, or playfulness as demonstrated in this ode to the King of Pop. 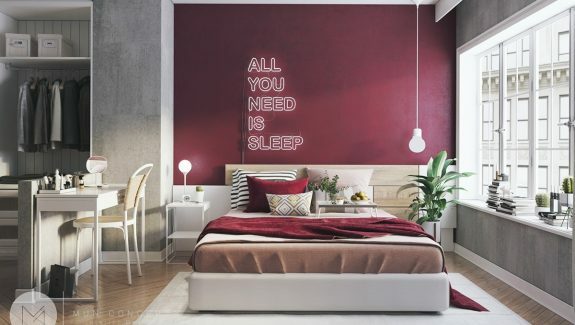 Bright pops of color have even more impact against a concrete wall, like these stunning orange pieces of art. 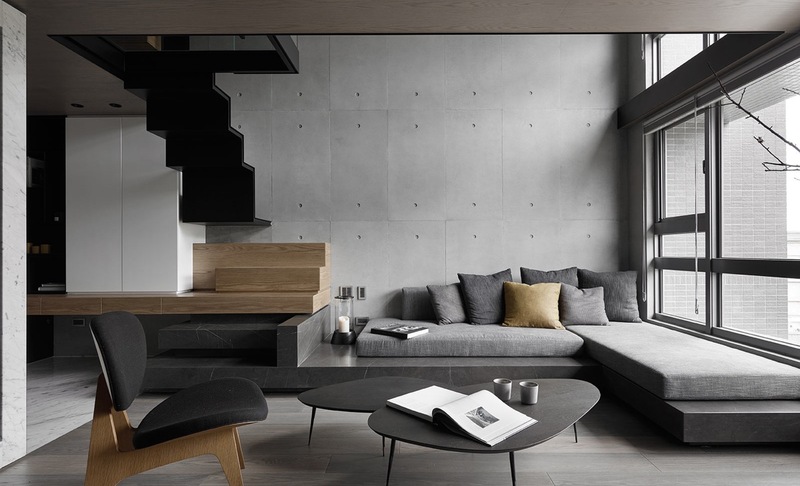 In this living room, the placement of the window creates a stunning contrast between outside and the stark concrete wall. 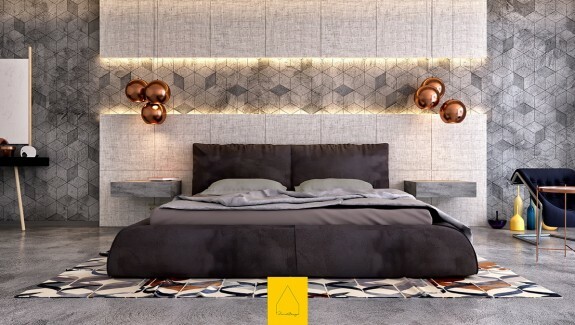 The decorative carvings in this wall give the concrete a softer effect. 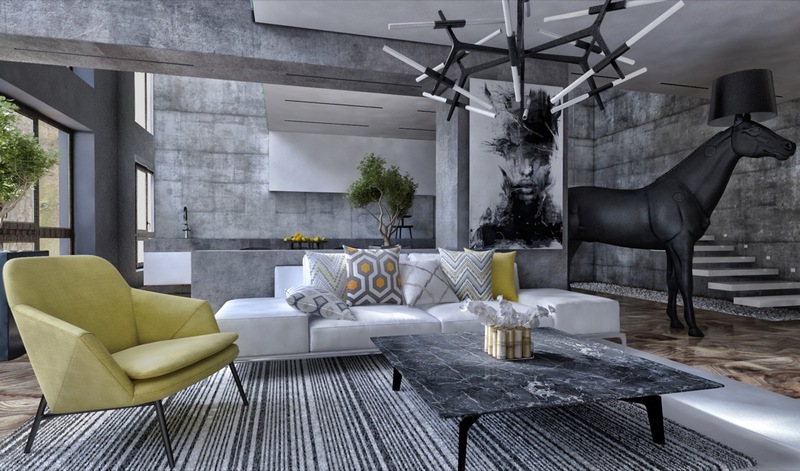 When concrete goes beyond one accent wall, other elements have to be dramatic to have the same impact. And what’s more dramatic than a life-sized horse statue? 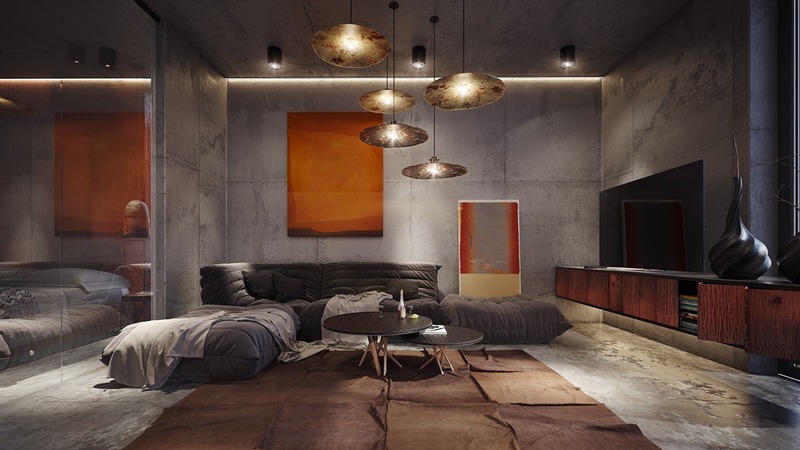 Lighting is another critical element when dealing with concrete — not enough and a room can quickly devolve into a cave. 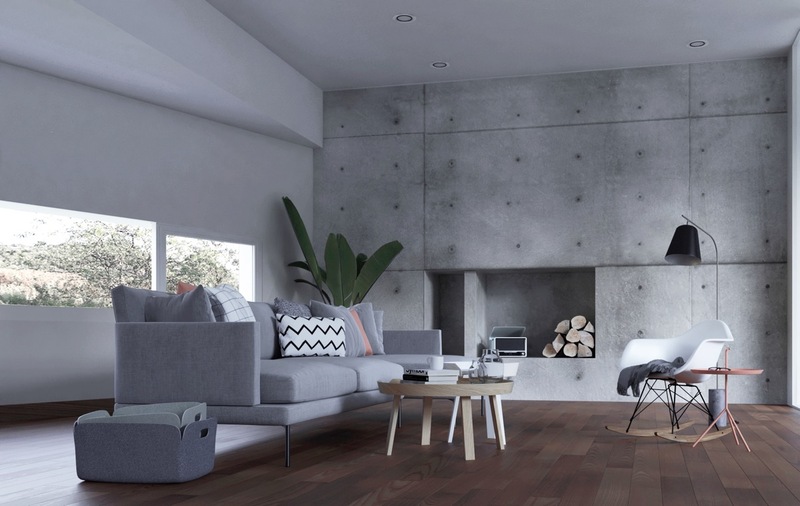 Painted concrete can add an extra layer of warmth while keeping the interesting texture. 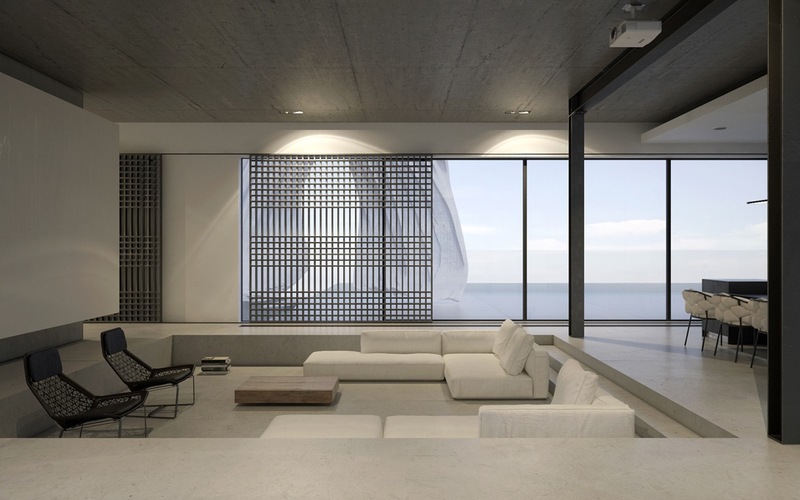 Concrete can provide an effective backdrop for minimalism. 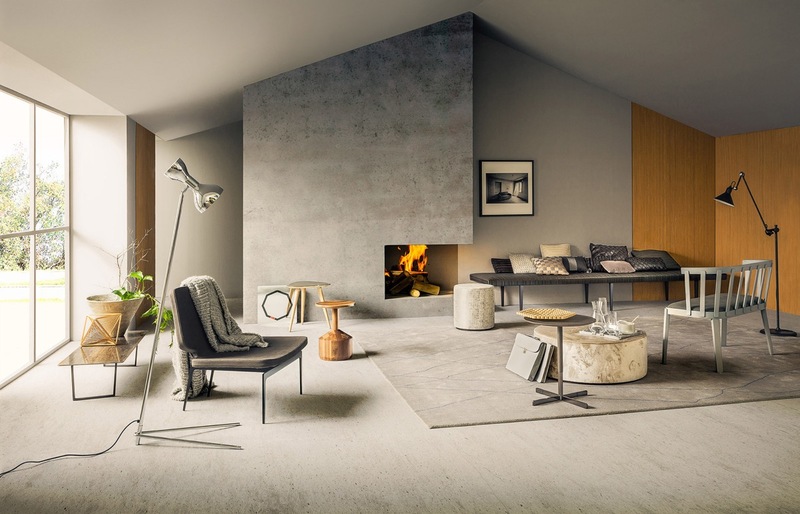 Nesting coffee tables used here are the Muuto Around tables. 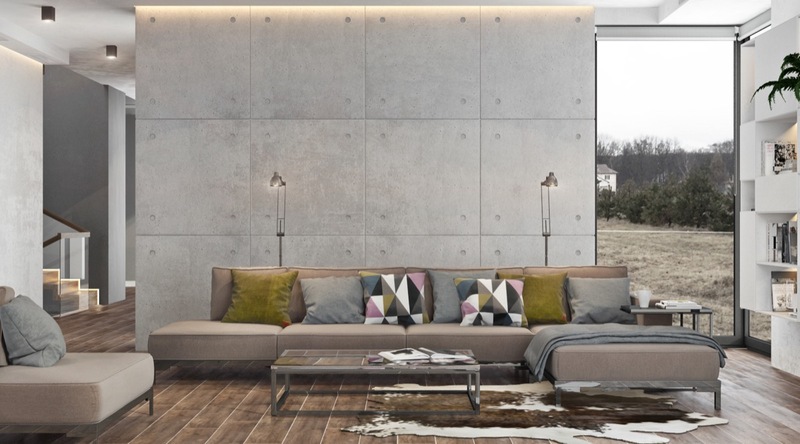 The rivets in this concrete design take the place of the pattern a wallpaper or art might add. 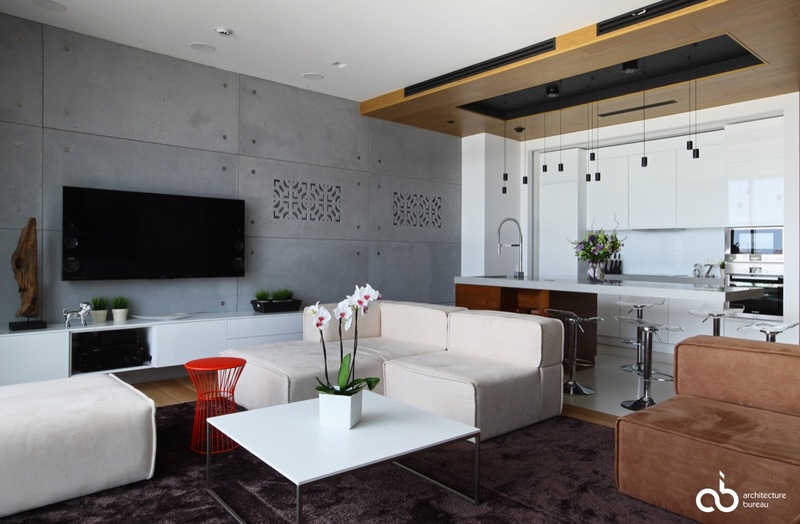 While the logistics of mounting a television to a concrete wall may be intense, there’s no denying the sleek and stylish results. 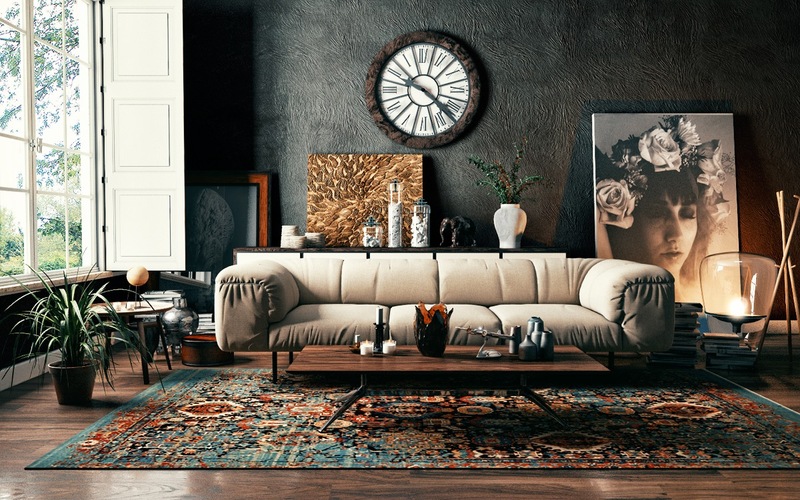 Check out that gorgeous ottoman coffee table! 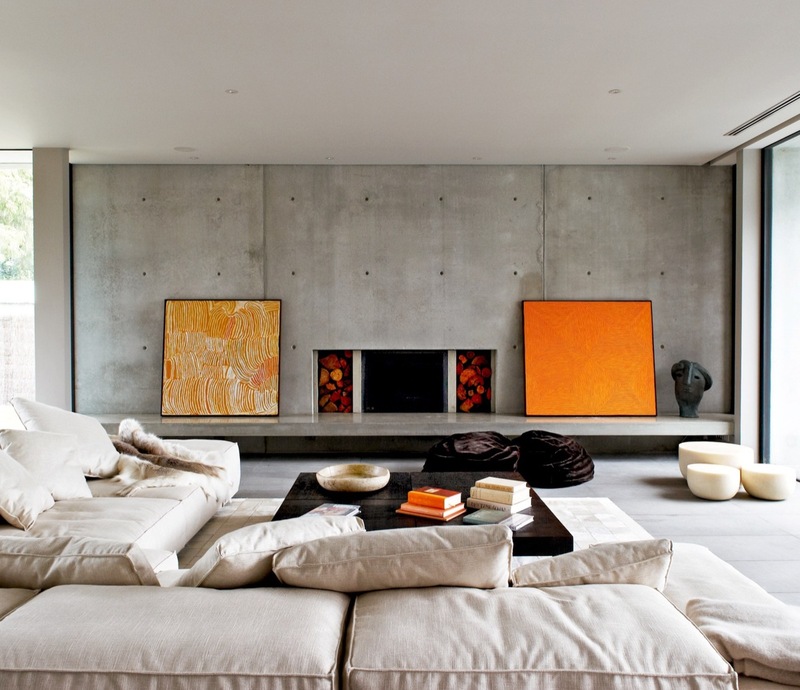 The concrete in this particular living room is a bit more subtle, but acts as an ideal frame for the fireplace. 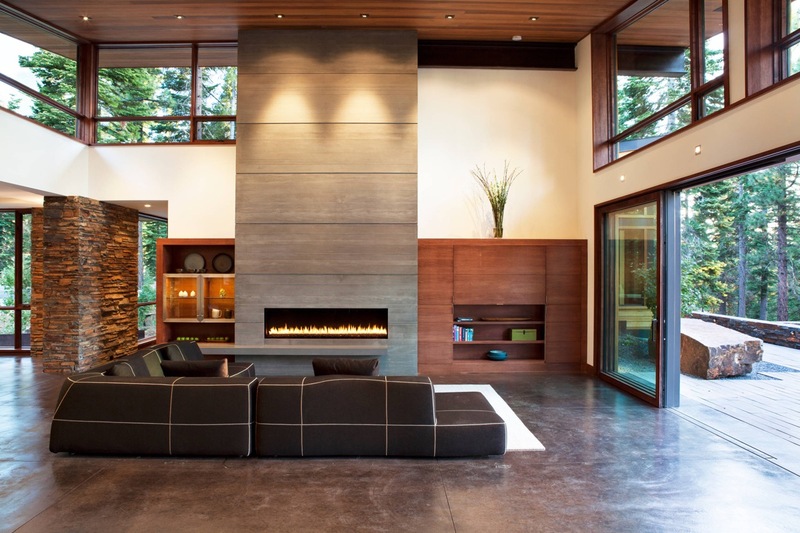 The texture in this concrete fireplace actually mimics wood while the smooth concrete flooring creates contrast. 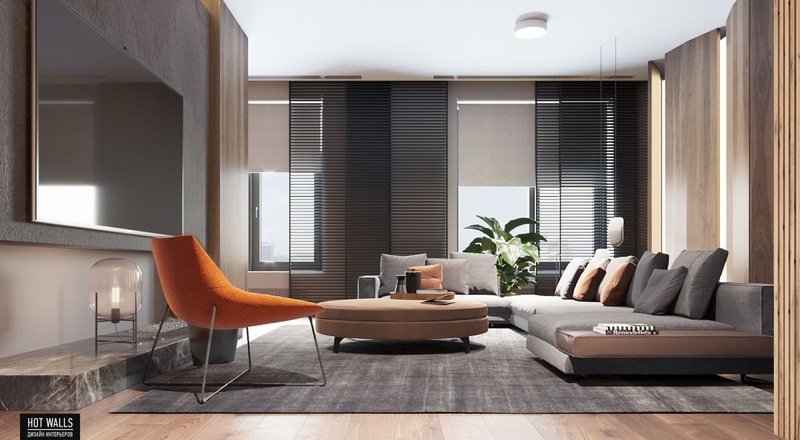 Soft textures also work well alongside concrete — here in a plush orange chair and soft rug. 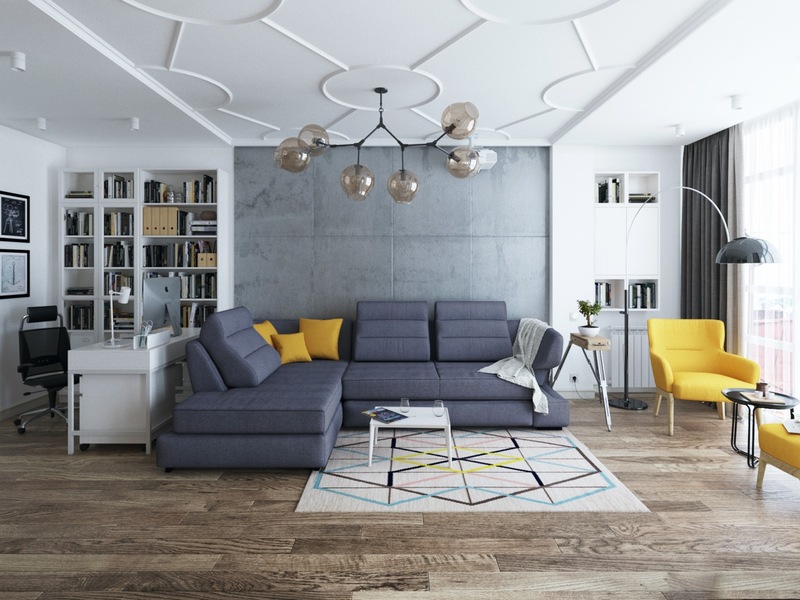 In this living room, unique floor lamps flank simple furniture for a modern but comfortable effect. An overstuffed sofa like this one can also work well. 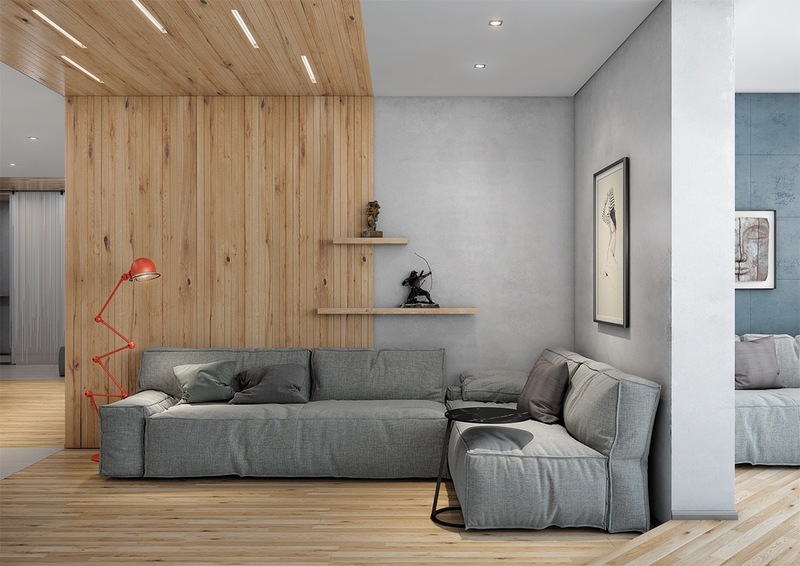 Lighting and shelving make this concrete wall a focal point in a pitched ceiling living room. 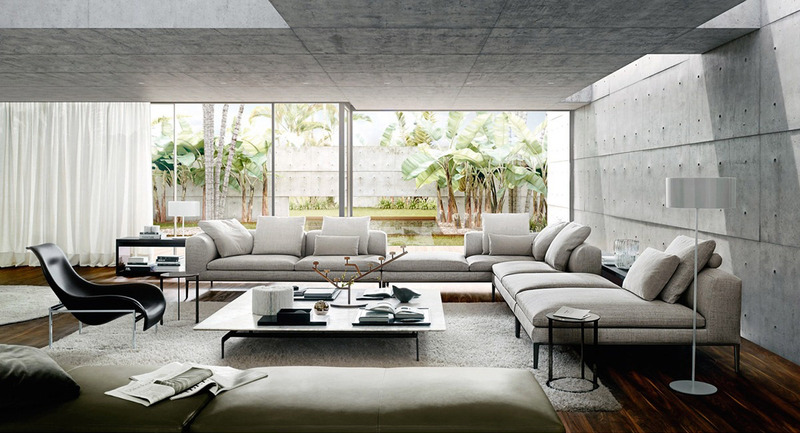 In an open floorplan, the light gray of concrete creates a theme for the entire living area. 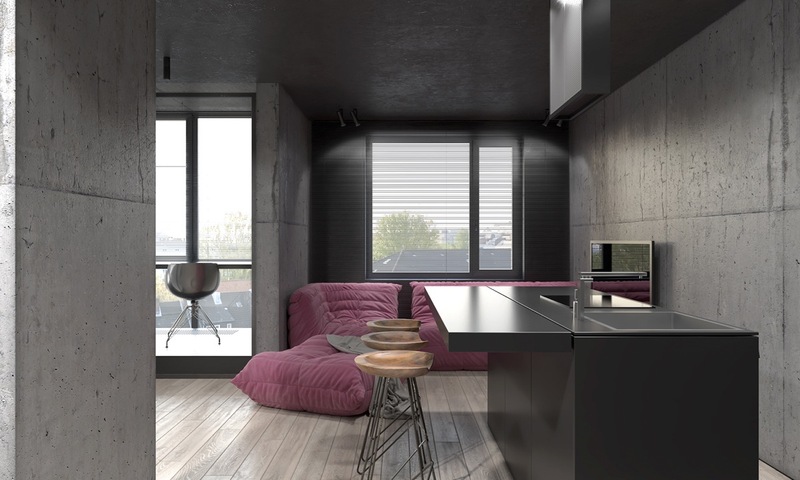 Pink and gray, soft and hard, concrete and wood — this tiny apartment in Moscow is a lesson in contrast. Recessed lighting brightens up this concrete ceiling once the sun goes down. Vases atop the modern coffee table make a statement. 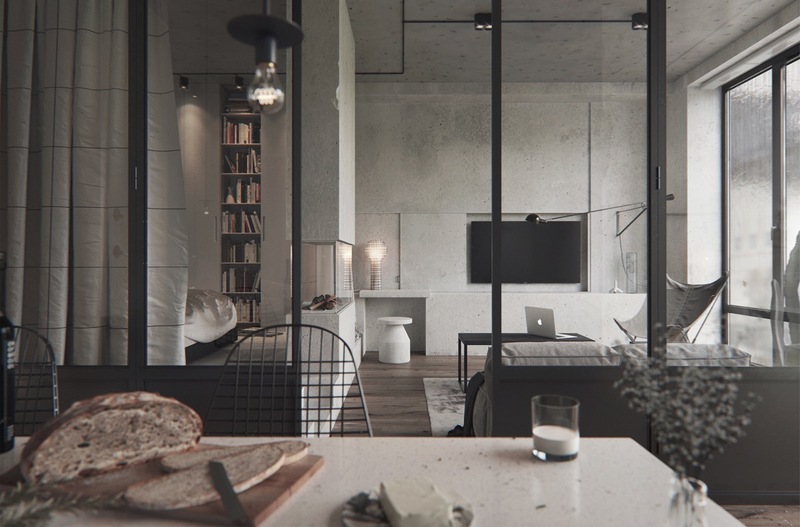 In this apartment, the industrial home decor works with concrete, brick, and cool lighting elements. 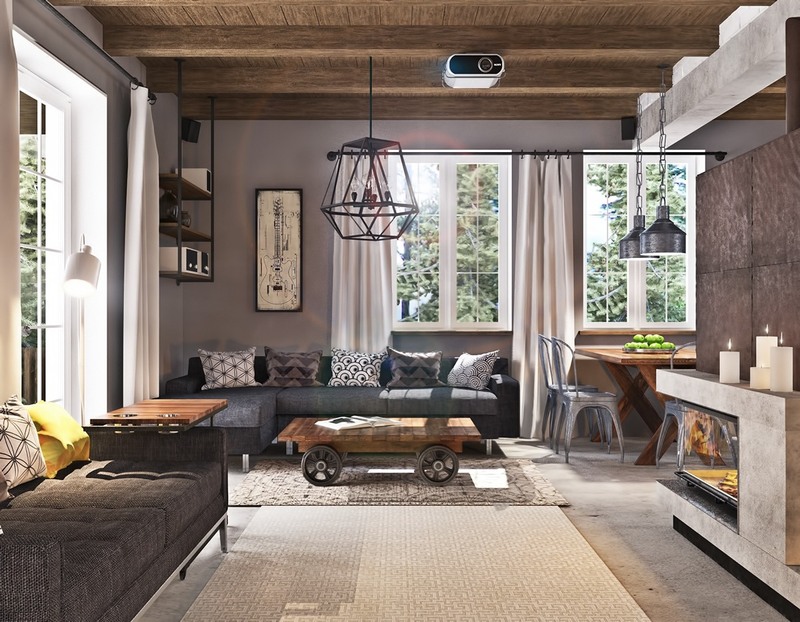 Exposed wood ceiling beams in this living room show the more rustic side of concrete. 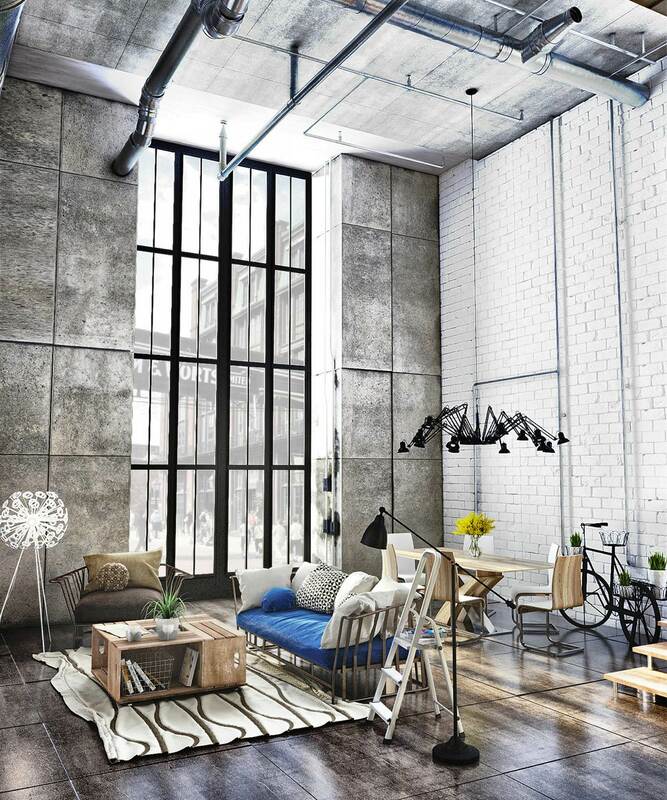 Vaulted ceilings, exposed pipes and white bricks have a dramatic impact in this industrial loft. 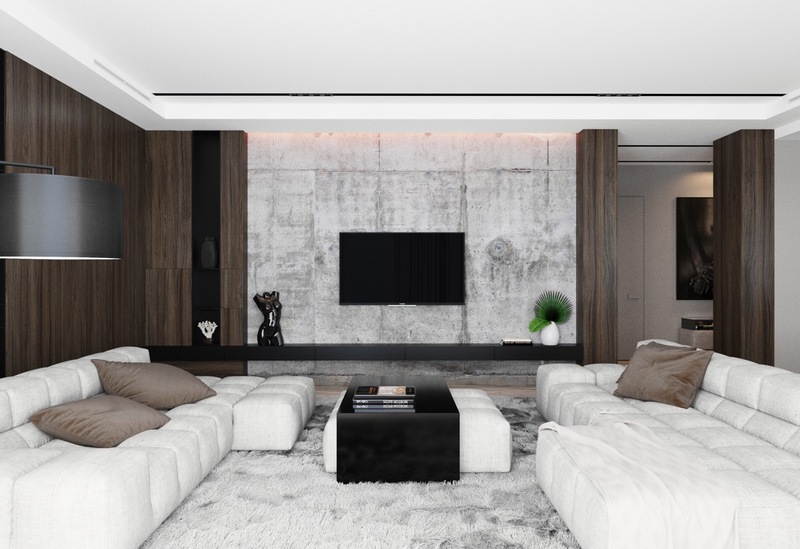 Minimalist reigns in this sunken living room with white furniture and concrete ceilings. A simple color scheme acts as the frame for an oversized piece of artwork in this living space. 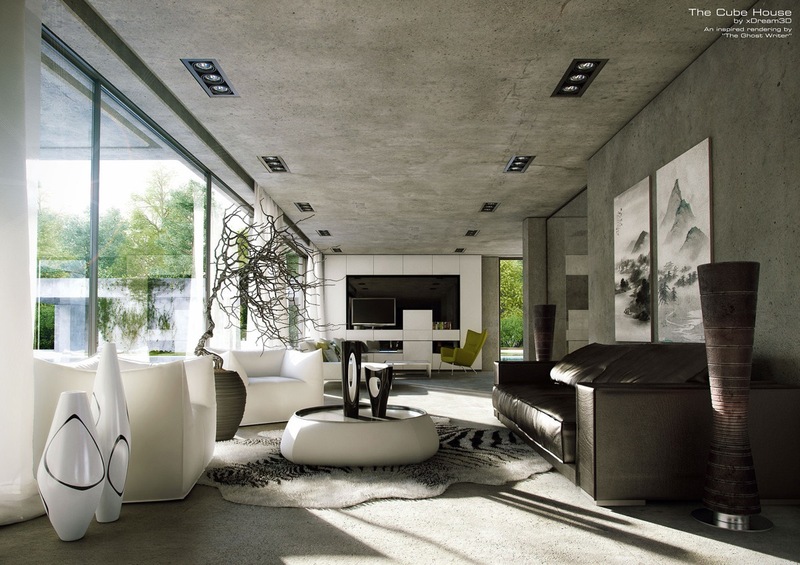 Concrete and glass are a classic combo in this lake house living room. 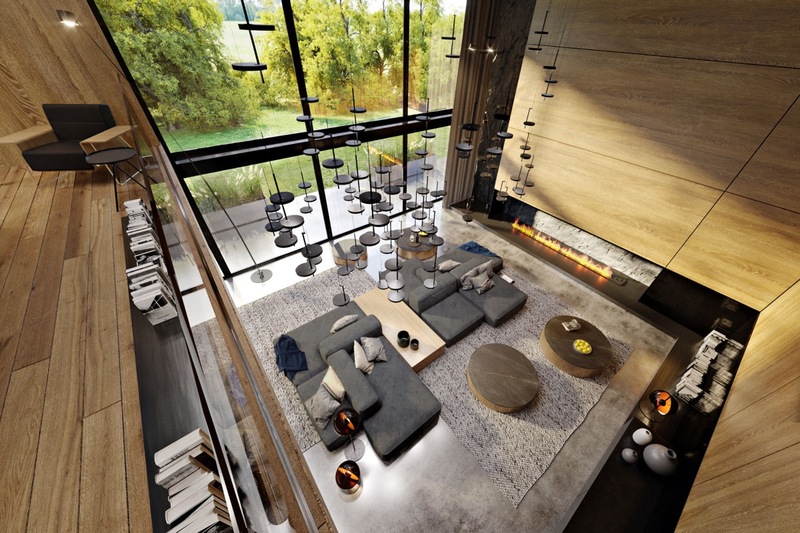 The glass globe chandelier in this artsy living room is a focal point centered on the concrete wall. Wood paneling and creative lighting turn this living room into a riverbed in a highly unique design.